When you stay at Kirribilli Guest House in Newquay, you'll be near the beach, a 4-minute drive from Fistral Beach and 7 minutes from Porth Beach. This guesthouse is 3.8 mi (6.2 km) from Watergate Bay Beach and 18.9 mi (30.4 km) from Padstow Harbour. Make yourself at home in one of the 31 guestrooms. Wireless Internet access (surcharge) is available to keep you connected. 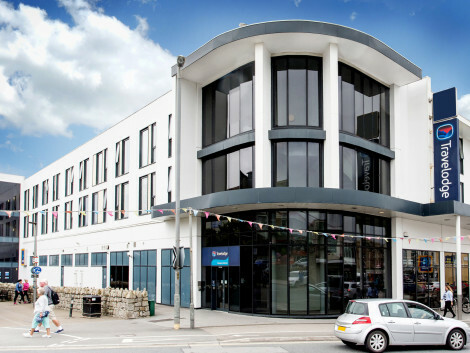 Located in Newquay (Newquay City Centre), The Escape is within a 10-minute drive of Fistral Beach and Porth Beach. This hostel is 3.3 mi (5.4 km) from Watergate Bay Beach and 16.7 mi (26.8 km) from Padstow Harbour. Enjoy a satisfying meal at C-View Bar & Restaurant serving guests of Carnmarth Hotel. Full breakfasts are available daily from 8 AM to 10 AM for a fee. With a stay at Great Western Hotel, you'll be centrally located in Newquay, a 4-minute drive from Porth Beach and 7 minutes from Fistral Beach. This hotel is 3 mi (4.9 km) from Watergate Bay Beach and 16.3 mi (26.3 km) from Padstow Harbour. With a stay at The Croft Hotel - Bed & Breakfast, you'll be centrally located in Newquay, a 5-minute drive from Fistral Beach and 6 minutes from Porth Beach. This guesthouse is 3.5 mi (5.6 km) from Watergate Bay Beach and 16.8 mi (27 km) from Padstow Harbour. Based in the British capital of surfing and surrounded by some of the country's most spectacular countryside, Newquay hotels are an excellent choice for exploring the world-famous beaches of Cornwall. Newquay is home to some of England's best beaches. Whether you're looking to lounge around with a good book, make sandcastles with the kids or try your hand at surfing, there's a spot for you. Fistral Beach, split into north and south sections, is the most famous beach in Newquay and a legendary location for surfing. The unique shape and position of the beach mean that waves here can reach up to 12m in height. There are regular competitions and events held on the beach, attracting thousands of visitors each year. Lusty Gaze, Great Western, Tolcarne and Towan Beach are four beaches set side-by-side, perfect for everything from family trips to romantic strolls along the coast. The north-facing Towan Beach is positioned closest to Newquay town centre and is also where you'll find The Island, a landmark section of the cliff that has become separated from the mainland and is only accessible by bridge. Travel a little further from the main stretch and you'll come across a series of secluded sections, from Little Fistral beside Fistral Beach to Mawgan Porth, around 5.5 miles from Newquay centre. Get up close with some of the ocean's most dazzling species at the Blue Reef Aquarium, located beside Towan Beach in the centre of town. Here you'll find underwater creatures from Cornwall, the Mediterranean and the Caribbean including tropical sharks, loggerhead sea turtles and colourful reef fish. For even more wildlife head to Newquay Zoo, home to over 130 species including zebras, wildebeest and lemurs. Within easy driving distance of Newquay is Holywell Bay Fun Park, a family friendly park that features bumper boats, go-karts and trampolines. Also within reach of the town is Cornwall's Crealy Great Adventure Park, covering 40,000 square feet of indoor play areas and 35 acres of outdoor play areas to explore. Attracting a fun-loving crowd of surfers, Newquay has Cornwall's best nightlife. Bertie O'Flannigan's is a lively Irish pub with regular live bands and DJ's performing during the night. The Bowgie Inn is set on the West Pentire Headland and offers spectacular views of Crantock Bay. Berties Nightclub is a legendary club venue that attracts the biggest DJs each summer. If you're looking to relax, the area has some cosy cafés and tearooms as well as a number of excellent restaurants. The friendly Mexican Cantina serves mouthwatering Mexican food, The Maharajah offers sea views and delicious Indian cuisine and Captain Jack's at Newquay Meadery is a family friendly medieval-themed restaurant that serves a number of historical dishes. Driving south from Newquay through Cornwall will take you to the south coast where you'll find The Roseland Heritage Coast and the creative town of Falmouth. Travel to the tip of Cornwall and you'll find St Ives, Penzance and Land's End.